Step 1 Use the aaa new-model global configuration command to enable AAA, which must be configured if you plan to use TACACS+. For more information about using the aaa new-model command, refer to the link, www.cisco.com/univercd/ cc/td/doc/product/software/ios121/121cgcr/secur_c/scprt1/index.htm. The key should match the one used on the TACACS+ daemon. Step 4 Use the aaa authentication global configuration command to define method lists that use TACACS+ for authentication. Step 5 Use line and interface commands to apply the defined method lists to various interfaces. Step 6 To enable authorization, use the aaa authorization global command to configure authorization for the NAS. Unlike authentication, which can be configured per line or per interface, authorization is configured globally for the entire NAS. Example 5-6 displays a sample configuration of a Cisco router with TACACS+ authentication for PPP. • The aaa new-model command enables the AAA security services. • The aaa authentication command defines a method list, CCIE, to be used on serial interfaces running PPP. The keyword group tacacs+ means that authentication is done through TACACS+. If TACACS+ returns an ERROR during authentication, the keyword local indicates that authentication will be attempted using the local database on the NAS. Note that the local database is not used if a REJECT response is received from the security server. • The tacacs-server host command identifies the TACACS+ daemon as having an IP address of 10.1.2.3. The tacacs-server key command defines the shared encryption key as cciesarecool. • The interface command selects the line, and the ppp authentication command applies the test method list to this line. Example 5-7 shows how to configure TACACS+ as the security protocol for PPP authentication using the default method list; it also shows how to configure network authorization through TACACS+. • The aaa authentication command defines a method list, default, to be used on serial interfaces running PPP. The keyword default means that PPP authentication is applied by default to all interfaces. The if-needed keyword means that if the user has already authenticated by going through the ASCII login procedure, PPP authentication is not necessary and can be skipped. If authentication is needed, the keyword group tacacs+ means that authentication is done through TACACS+. If TACACS+ returns an ERROR during authentication, the keyword local indicates that authentication will be attempted using the local database on the NAS. • The aaa authorization command configures network authorization via TACACS+. • The tacacs-server host command identifies the TACACS+ daemon as having an IP address of 3.3.3.3. • The tacacs-server key command defines the shared encryption key as simoniscool. • The interface command selects the line, and the ppp authentication command applies the default method list to this line. Example 5-8 displays a sample configuration where accounting is also enabled. • The aaa authentication command defines a method list, default, to be used on serial interfaces running PPP. The keyword default means that PPP authentication is applied by default to all interfaces. The if-needed keyword means that if the user has already authenticated through the ASCII login procedure, PPP authentication is not necessary. If authentication is needed, the keyword group tacacs+ means that authentication is done through TACACS+. If TACACS+ returns an ERROR during authentication, the keyword local indicates that authentication will be attempted using the local database on the NAS. • The aaa accounting command configures network accounting through TACACS+. In this example, accounting records stop-only, meaning that the session that just terminated will be sent to the TACACS+ daemon whenever a network connection terminates. If the first server does not respond within a timeout period (default 5 seconds), the next server is queried, and so forth. Typically, the console port is not configured for authorization. Table 5-4 compares the main differences between TACACS+ and RADIUS. RADIUS encrypts only the password in the access-request packet from the client to the server. TACACS+ encrypts the entire body of the packet but leaves a standard TACACS+ header. RADIUS combines authentication and authorization. TACACS+ uses the AAA architecture, separating authentication, authorization, and accounting. TACACS+ supports other protocols, such as AppleTalk, NetBIOS, and IPX. RADIUS does not allow users to control which commands can be executed on a router. TACACS+ allows network administrators control over which commands can be executed on a router. 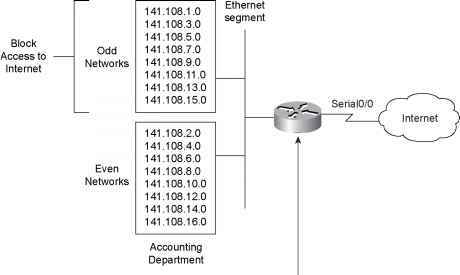 NOTE You can configure both RADIUS and TACACS+ concurrently on a Cisco router provided that you have defined different list names and applied the list to different interfaces. NOTE You can download and install a trial copy of Cisco Secure ACS for Windows NT/2000 or UNIX. This comes with a built-in RADIUS and TACACS+ server. You also need a Cisco router with IOS 12.X with one working Ethernet port. This will reinforce your understanding of the AAA concept. For more information, visit the Cisco Secure Software center at www.cisco.com. The IOS debug command set for RADIUS and TACACS is extensive. Presented here are some common RADIUS and TACACS debug outputs found in real networks. Example 5-9 displays a sample output from the debug aaa authentication command for a RADIUS login attempt that failed. The information indicates that TACACS is the authentication method used. Example 5-11 displays a sample output from the debug radius command that shows an unsuccessful login attempt, as indicated by an Access-Reject message.